“Banzai! Banzai!” screamed the Japanese at the top of their lungs as they launched a ferocious night attack against Marines dug in on Guadalcanal. It was October 24, 1942, and the intensity of the Japanese assault in the darkness was terrifying. Through it all, however, Sergeant “Manila John” Basilone—his fellow Marines gave him that nickname because Basilone had been a soldier in the Philippines in the late 1930s—kept his cool. He was constantly on the move––repositioning the heavy .30-caliber machine guns in his weapons platoon, helping nervous gunners clear jams, and inspiring the Marines in his company to fight on as their battle against overwhelming odds persisted through the long night. Basilone’s heroism that night was recognized with the award of the Medal of Honor––the first to an enlisted Marine in World War II. Some two and a half years later, on February 19, 1945, now Gunnery Sergeant Basilone again demonstrated extraordinary heroism on Iwo Jima–– receiving the Navy Cross for his combat gallantry. This is the story of the hero of Guadalcanal and Iwo Jima––who remains one of the most celebrated Marines in the Corps’ history. Born in Buffalo, New York, on November 4, 1916, Basilone was the son of an Italian immigrant father (a tailor by trade) and one of 10 children. He attended St. Bernard parochial school in Raritan, New Jersey, and finished the eighth grade. Basilone did not go on to high school but decided instead, when he was 18 years old, to enlist in the Army for three years. After completing basic training, Private Basilone sailed first to Hawaii and then on to the Philippine Islands, where he served a tour of duty in the tropics and spent considerable time enjoying life in Manila. 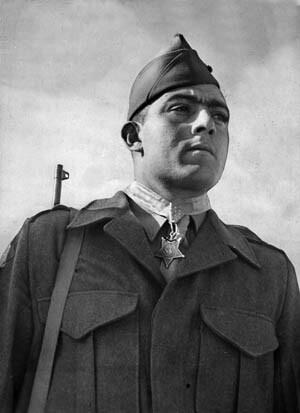 Marine Sergeant John Basilone receives his Medal of Honor in recognition of his heroism on Guadalcanal on October 24-25, 1942. After being honorably discharged in 1937, Basilone went to work as a truck driver in Reisterstown, Maryland. Either civilian life did not agree with Basilone or he missed life in uniform, or both. In any event, believing that life as a Marine would be better, Basilone enlisted in Baltimore, Maryland, in July 1940. He trained at Quantico, Virginia, Parris Island, South Carolina, and New River, North Carolina—which later became Camp Lejeune. Basilone also served at Guantanamo Bay, Cuba, before deploying to the Pacific. On August 7, 1942, American, Australian, and New Zealand forces landed on Guadalcanal in the Solomon Islands. This was the first major offensive launched by the Allies against the Japanese and its intent was to capture the island in order to have a staging base for future operations against the large enemy base on Rabaul. The Allies quickly overran the smaller number of Japanese defenders who had been on the island since May 1942. The Japanese, however, fully aware of the strategic importance of Guadalcanal, were not finished. On the contrary, the enemy sent some 15,000 troops to Guadalcanal in early October 1942 and planned a major attack to overwhelm the Marine defenders of a vitally important airfield on the island. The Japanese had been building this airfield at the time of the Allied invasion and it was now in American hands; it was renamed Henderson Field (after a Marine aviator killed during the Battle of Midway) by the Americans. On the night of October 24/25, 1942, some 3,000 Japanese troops attacked the U.S. Marines defending the Lunga perimeter and Henderson Field. Among those defenders was “Manila John” Basilone, who was a part of then Lt. Col. Lewis B. “Chesty” Puller’s 1st Battalion, 7th Marines, 1st Marine Division. Basilone was in charge of two sections of heavy machine guns––about 16 men. Eyewitnesses remembered him fighting “valiantly” against a “savage and determined” Japanese attack. After the enemy had put one of Basilone’s gun sections out of action, leaving only two men able to carry on, Basilone picked up a 90-pound .30-caliber machine gun and tripod, ran 200 yards to the silenced gun section, and started firing point blank into the charging Japanese. Then, despite being under continual fire, Basilone repaired another machine gun and personally manned it, gallantly holding his line. 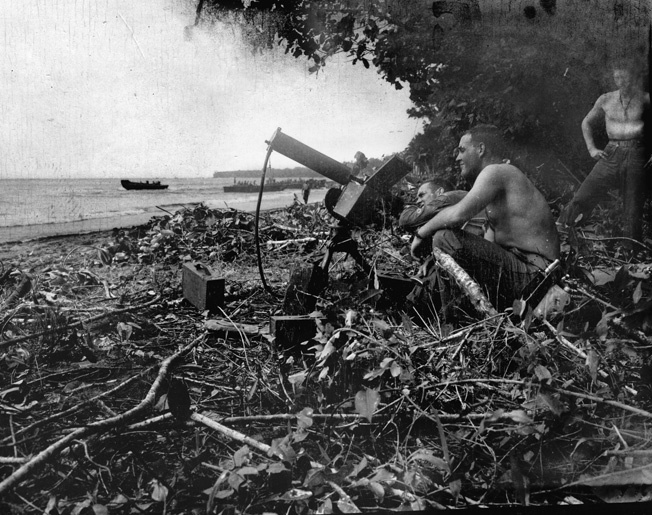 A machine position on Guadalcanal. During a Japanese attack in 1942 Basilone picked up a .30-caliber machine gun, ran 200 yards, and fired point-blank at the Japanese. As the Japanese bodies started to pile up in front of his emplacement, the enemy attacked Basilone from the rear––and he killed a number of them with his pistol. Later that night, ammunition for Basilone’s guns was critically low and his supply lines were cut off. Once again ignoring the enemy fire around him, Basilone ran some 200 yards through hostile lines to an ammunition point, where he gathered up shells and then battled back to his gunners with the ammunition they needed to defend their position. He apparently crawled and sprinted through enemy fire a second time to obtain much needed ammunition for his guns and, after making it back, continued the battle against the enemy. Chesty Puller, recognizing that Basilone was the glue that had held his own platoon together, and contributed immeasurably to the annihilation of a Japanese regiment, pushed hard for official recognition for Manila John. The result was the award of the Medal of Honor with its citation signed by President Franklin D. Roosevelt—making Basilone the first Marine enlisted recipient of America’s highest combat award in World War II. Basilone received the decoration in a ceremony in Australia in May 1943. The Marine Corps then sent Basilone home to the United States on a countrywide war bond tour. A homecoming parade in his honor in Raritan on Sunday, September 19, 1943, drew a crowd of 30,000 men, women, and children. The parade made the national news in Life magazine. Fox Movietone News also filmed the event and the newsreel was shown in thousands of movie theaters across the country. Basilone quickly became a celebrity and was recognized everywhere he went. His neighbors gave him a $5,000 war bond in appreciation for his heroism on Guadalcanal. But, while Basilone understood the admiration, and realized that his efforts had raised more than a million dollars for the war, he was uncomfortable with life on the “Home Front” and wanted to return to the Marine Corps—and the war in the Pacific. In late December 1943, after requesting once again to return to the Pacific, Gunnery Sergeant Basilone was assigned to Camp Pendleton, California, where he was assigned to a unit training to deploy to the Pacific. While there, he fell in love with a female Marine sergeant, Lena Mae Riggi. They dated a few months, then married in July 1944. After a short honeymoon on her parent’s farm in Oregon, Basilone’s unit got orders to sail to the Pacific and Manila John shipped out before Christmas 1944. He never saw his wife again. Although he did not know it at the time he left Camp Pendleton, Basilone was destined to participate in the Marine amphibious landings on Iwo Jima. This strategically situated eight-square-mile island, located halfway between Tokyo and Saipan, had two good airfields. Since these airfields were only 660 miles—or three hours flying time—from Tokyo, this meant that B-29s flying from Iwo could be escorted all the way to their Japanese targets by P-51 Mustangs and P-47 Thunderbolts. But, while this made Iwo Jima a critical piece of real estate for future Allied combat operations against the Japanese homeland, there were some 21,000 Japanese defenders on the island; the conquest of Iwo Jima would not be easy. During the landing on Iwo Jima, Basilone led his men off the beach, destroyed a Japanese blockhouse, and helped guide a tank through a minefield before his luck ran out. In any event, on February 19, 1945, Basilone waded ashore with his platoon on Red Beach II, located on the southern tip of the island near Mt. Suribachi. It was D-day, and Basilone was a machine-gun section leader in Company C, 1st Battalion, 27th Marine Regiment, 5th Marine Division. Enemy fire from heavily fortified bunkers was murderous, and everyone was pinned down in the black volcanic sand on the beach. 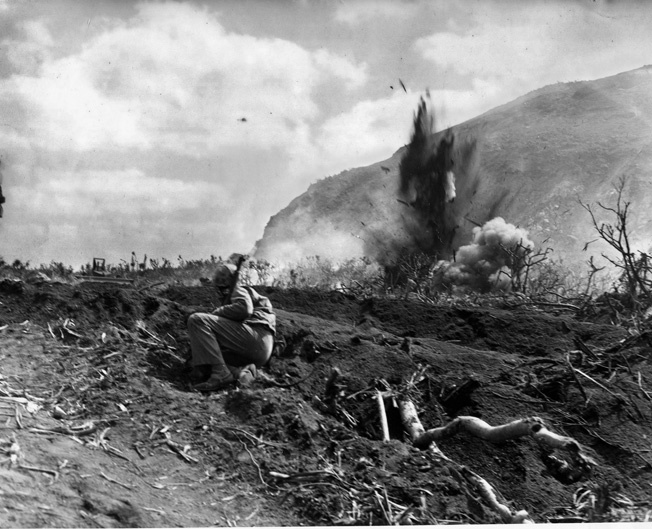 Basilone, recognizing that his men would survive only if they kept moving, yelled at them to “Get off the beach!” Then, shrewdly gauging the tactical situation, he worked his way around the flank, singlehandedly attacking and destroying a Japanese blockhouse with grenades and demolitions, which allowed his unit to capture a nearby airfield. A short time later, Basilone helped a Marine tank that had become trapped in an enemy minefield and was in danger of being destroyed by mortar and artillery fire. Despite the rain of exploding shells all around him, Basilone managed to guide the tank to safety. But then his luck ran out. Just minutes later, while moving along the edge of an airfield, shrapnel from an exploding mortar shell grievously wounded him. “Manila John” Basilone died about 30 minutes later. He was 27 years old. For his gallantry on Iwo Jima on February 19, Basilone was awarded a posthumous Navy Cross and his widow was later presented this decoration and his posthumous Purple Heart. The Navy Cross, which ranks second only to the Medal of Honor as an award for combat heroism, is so sparingly awarded that Basilone is the only enlisted Marine to have received both the Medal of Honor and the Navy Cross. He also apparently is the only Medal of Honor recipient to be killed in action after returning to combat. Basilone is interred in Arlington National Cemetery and has not been forgotten: in July 1949, the destroyer USS Basilone (DD 824) was named in his honor. The U.S. Postal Service issued a stamp bearing his likeness in November 2005. New books about him also have appeared in print: James Brady’s Hero of the Pacific, and Jim Proser and Jerry Cutter’s I’m Staying with My Boys. Finally, the 2010 HBO miniseries The Pacific also features Basilone, with actor Jon Seda playing him. As for Lena Mae Basilone, she died in June 1999 at the age of 87. She never remarried. Tags Allies, arlington national cemetery, Axis, Battle of Midway, Camp Pendleton, Guadalcanal, Henderson Field, Iwo Jima, Japan, Japanese, Lewis B. "Chesty" Puller, medal of honor, medal of honor recipient, Solomon Islands, South Carolina, United States Marine Corps. Jon Seda brilliantly portrays Basilone in the mini-series the Pacific. I urge anyone with an interest in WWII that hasn’t yet seen this series to do so. Even though I knew it was coming it was very sad to see Basilone (played by Seda) get killed on Iwo Jima. What might this man have done with his life if he had survived the war?